Burmese (chickpea) tofu is made by cooking split pea flour or chickpea flour and water batter until it thickens and can set. One of the other methods is to soak the split chickpeas, blend and use that batter. I make my chickpea tofu with chickpea flour and with less liquid so it is a sturdier, and quick version of Burmese tofu. This recipe makes about 2.5 to 3 cups cubed tofu which can be stored for a few days refrigerated. The tofu can also be made with Chickpea flour (which is ground garbanzo beans (white chickpeas), pure besan / gram flour (which is flour of brown chickpeas (kala chana) or split brown chickpeas (chana dal)), or mixed flour besan which can have 2 different types of chickpea / split pea flour, or yellow split pea flour. Each of the flours need different amounts of liquid. Besan (gram flour) is also ground finer than white chickpea flour. Because of these differences, chickpea flour generally makes a thicker batter and needs more water to achieve the similar consistency as besan batter if the recipe was written with besan. Besan will need less liquid to make an equally sturdy tofu as Chickpea flour tofu. The tofu recipe below made with any of the flours, without adjusting the recipe will still be usable wherever needed. Depending on the flour used, the resulting tofu cubes might be soft or firm. Use less water for firmer and more water for softer chickpea tofu. 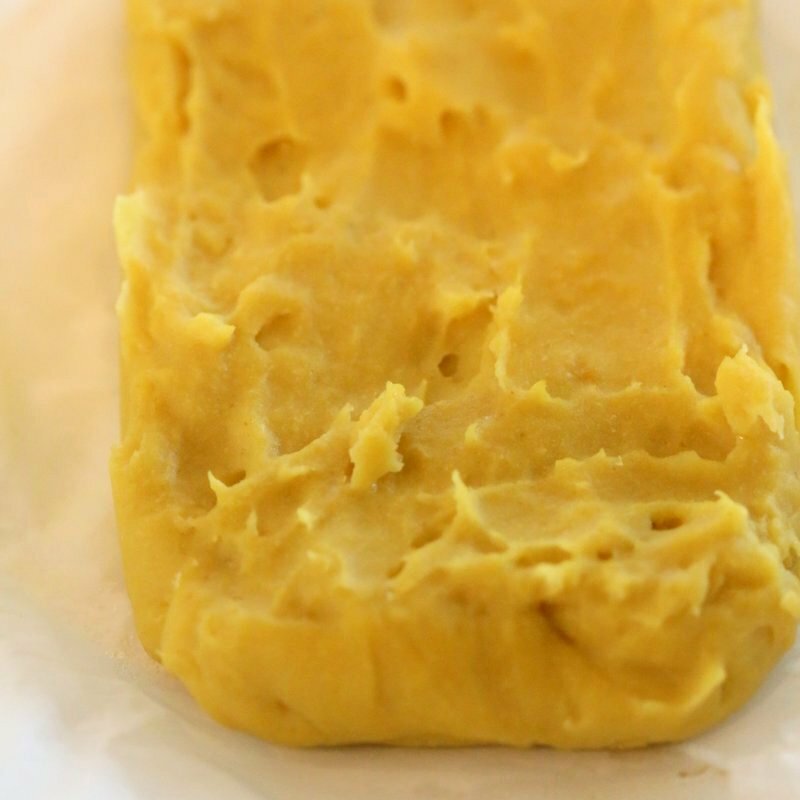 Chickpea flour is mixed with water to form a smooth batter. 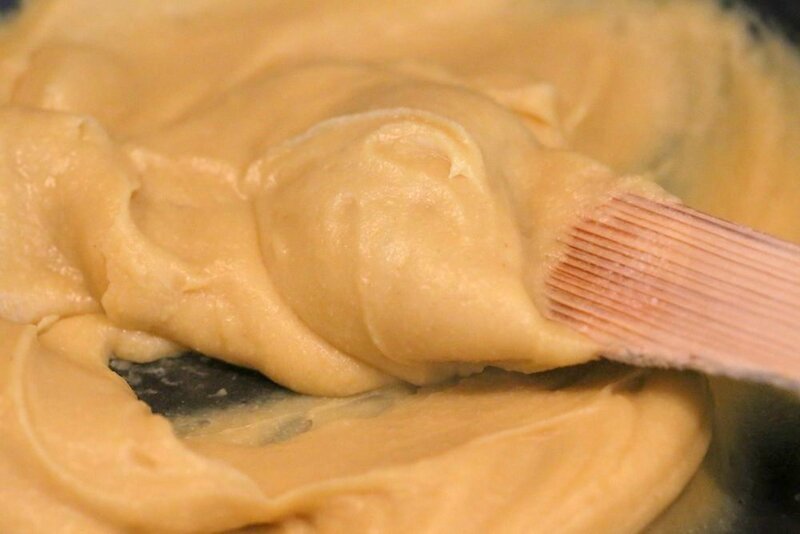 The batter thickens into a thick custard like consistency which sets and can be easily sliced. I use these properties of chickpea flour in many recipes, like this nut-free Nacho cheese slice, these chickpea flour pasta noodles and more. This recipe is adapted from the spiced chickpea tofu in my book. You can use it as a substitute for soy tofu in many recipes. It does well in curries, tossed in dressing, in wraps, salads, also makes a great morning scramble, or egg salad!, breaded tofu etc. It also sticks to the pan like regular tofu while stir frying, if your pan isnt good ;). 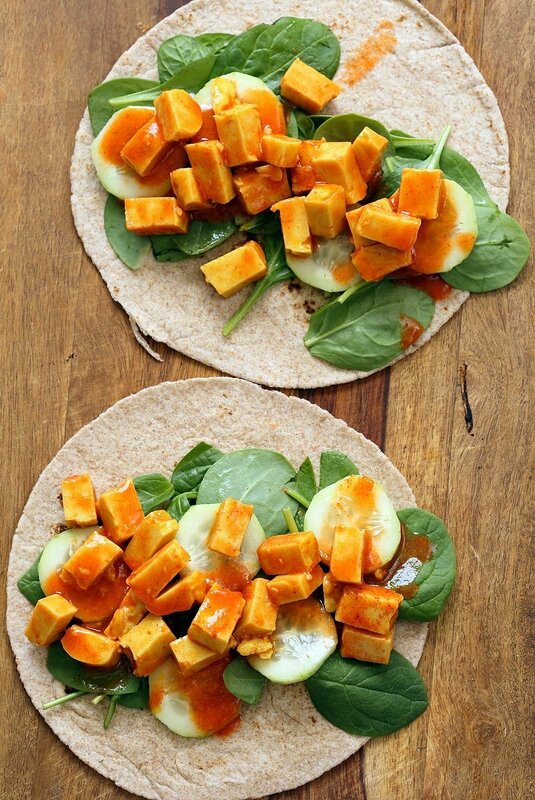 Made these Buffalo Tofu Wraps with Chickpea flour tofu tossed in buffalo hot sauce. This tofu might not absorb marinades as quickly. So I generally prefer to flavor the tofu itself while making it. Mix in herbs, spices and flavors into the batter before cooking it. That way the tofu is already infused with a profile depending on where you are using it. I usually add garam masala and cayenne when using in curries and some soy sauce and lemon when adding to asian fusion, some italian herb blend for other uses like a mashed up marinated tofu salad. Blend the chickpea flour water and spices into a smooth batter. Cook over medium heat. the batter will start to get lumpy after a minute or so. Keep stirring frequently. 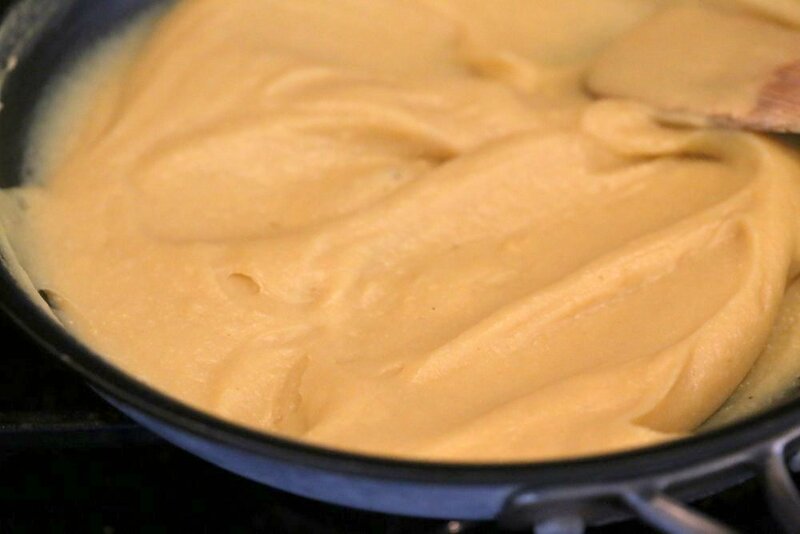 The batter will eventually thicken evenly and become custard like. Cook for another 2 minutes so the chickpea flour is cooked through. You can taste the mix carefully at this point to ensure that the chickpea flour doesnt taste raw and adjust salt if needed. the mixture will also start to come away from the pan. Transfer the custard to a parchment lined container. Cool for 10 minutes then refrigerate for about an hour. Remove from parchment, cube and use. Keep refrigerated for upto 4 days. Chickpea flour Tofu. 10 min Non soy tofu made with Chickpea flour or Besan / gram flour. Easy Burmese tofu. Vegan Gluten-free Soy-free Nut-free Recipe. Makes about 3 cups of cubed chickpea tofu. 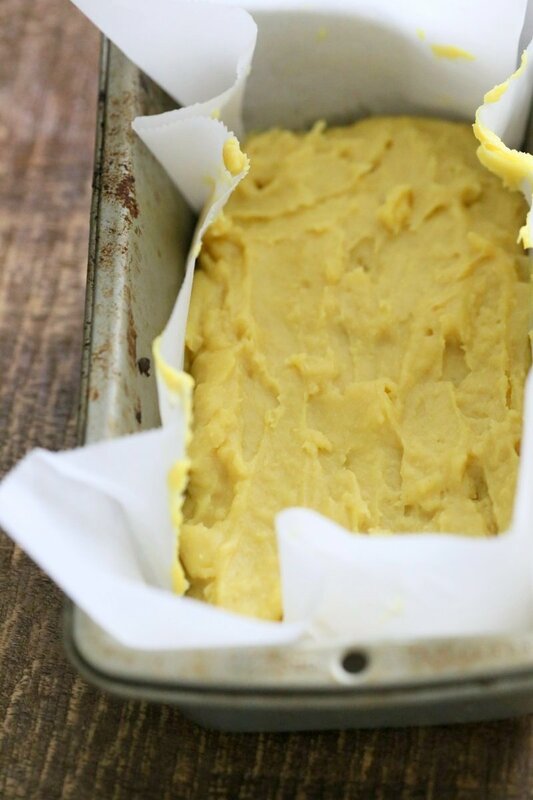 Grease a bread pan or line with parchment and keep ready. (9 by 5 rectangle or any similar rectangle or smaller square pan). In a bowl whisk all the ingredients under chickpea tofu until there are no lumps, or use a blender..(or you can add the ingredients directly to the pan and whisk to combine). I use a blender for quick and smooth batter. Pour the chickpea flour mixture into a deep saucepan. Cook over medium heat. Stir continuously. 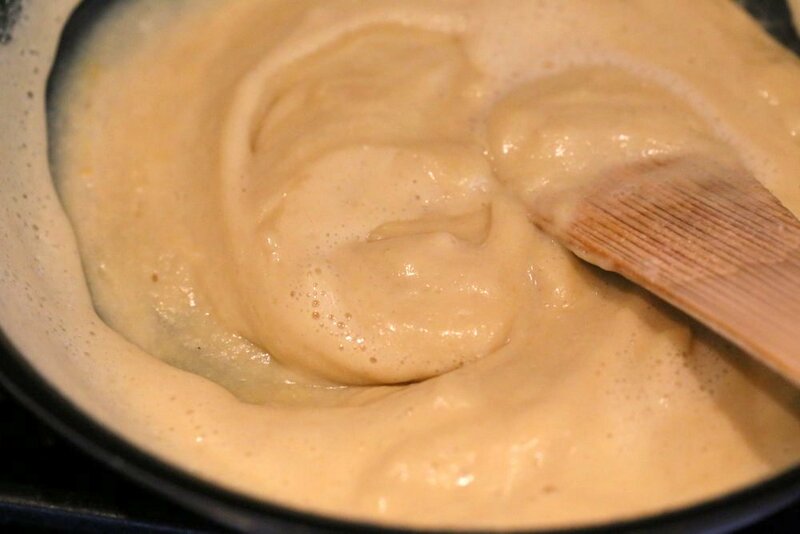 The mixture will start to get lumpy as the pan heats up (see video) and then thicken evenly and considerably. 4 to 5 mins. Once the mixture is evenly thick and stiff, keep cooking for another 2 minutes so the chickpea flour gets cooked through. Also tap the spoon or spatula to drop the mixture stuck to it to the pan. If the mixture is starting to brown, reduce the heat to medium low. You can taste test the mixture at this point carefully, to ensure that there is no raw chickpea flour flavor and adjust salt if needed. Pour the mixture into the prepared loaf pan or parchment and even it out using a spatula or another parchment if needed. Let it cool, then refrigerate for atleast an hour to set. Remove the set slab from the pan. Slice into cubes. Store in an airtight container refrigerated for upto 4 days. The tofu can leak some moisture while it sits. drain and use. Variations: Use vegetable stock instead of water. Add nutritional yeast for cheesy flavor or other herbs and flavors of choice. To use in stir fries or curries: Crisp in a tsp of oil until golden on some edges. (see this recipe). Marvellous, so many recipes open now! Thanks! So glad you like the book! The picture shows using parchment paper and the directions call for greasing the pan: Which worked out best? Your recipe is innovative. One can have chick pea flour tofu in scooped small boll shapes. After shallow frying, they can be added in Kadhi. Thank for sharing recipe. Thanks! Yes i use it in similar ways in kadhi and dal. Oh my gosh! This “tofu” is so clever Richa! I feel like running to the kitchen right now to make it, I’m so excited by how easy it is (and no soy, yay!!!) <3 thank you so much! Wow! I can’t believe I just made tofu! I killed my own chickpea flour because I only had whole chickpeas and even adding that extra step the recipe didn’t take long to make! I love it! Thank you so much. Thats amazing! Yes if you have a high powered blender, you can get flour within minutes! This is a wonderfully different idea! Thanks for the inspiration. Excited to make my own tofu! Any way to figure the protein amount? Thank you for all the GREAT recipes. From Bob’s red mill packaging. 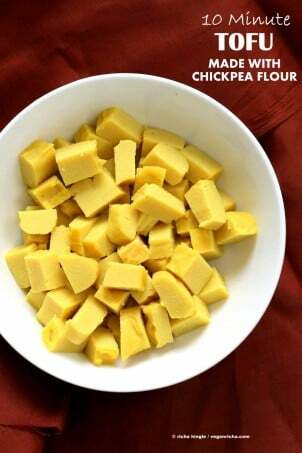 1 cup of chickpea flour has 24 gm of protein, 10% Iron, 21 % dietary fibre. Just made this, I had earmarked it from the book as one to try. It reminded me so much of making salt dough (home made play doh) for the children when they were younger. About the same colour too! Is cooling now, but I’ve already snacked a few cubes, They have so much more taste than true tofu. I am thinking marinated in sesame oil, soy sauce and ginger and baked for our supper. Next time I might try a Chinese style sauce, so leave out the cumin from the tofu recipe. So many ideas! Hi. What is the difference between chickpea flour and besan flour and gram flour? I thought they were all the same thing. Thank you! I explain in the first 3 paragraphs of the post. They are different chickpeas and often ground to different texture. See the above paragraphs where I mention what chickpeas and their names, and how it matters when using one for the other in recipes, if the recipe is specifically uses one. Do you think it must be bean flour? Could I use coconut flour? Coconut flour just absorbs all the liquid and does not have a custard like thickening property, so it will not work. You can use lentil flour. I think you should change how long it takes you to do this recipe. I thought it would take 10 minutes but then it has to chill for an hour – very misleading in the recipe. If it takes an hour until I can eat it, then ITS NOT A 10 MINUTE RECIPE! 10 minutes active time. You can let it cool for 5-10 mins, slice and use if you like. it will just be softer tofu. @Julia: Jeez. Read the times at the head of the recipe. Prep time: 5 min; cook time 10 min; total 15 min. Those times mean total prep time. How you finish the recipe will add time to the final time. @Richa: Thanks, Richa. I make chickpea tofu from a different, but similar, recipe, and it’s delicious. I sometimes add finely minced garlic, minced sun dried tomatoes, red pepper flakes, and other seasonings. The sky’s the limit as far as flavorings go. Go wild! Any alternate to garlic powder? omit it or add a pinch of asafetida. I was wondering if you are able to and or had tried to freeze the tofu? (Even if it may not be as amazing when you defrost it! 😉 -and how long it lasts in the freezer?) Also when you go to use it after it has been refrigerated (Or defrosted) do you re heat the ‘tofu’ on the stove on a pan or in the microwave? Thank you for your time and consideration I really appreciate it. I haven’t frozen it yet. Freeze some and let me know how it affects or doesnt affect the flavor and texture. the tofu pieces can be thawed and used as oyu would used them when fresh. This recipe looks great! Do you think it could work with other legume flours, such as lentil, lupine, or cowpea flour? Hi Lena, each bean/lentil flour is different in terms of thickening. Some might need less liquid and some more. Some might thicken but set more like a jello, some might never fully set and so on. You would have to try each and see how it works. I have used chickpea flour, chickpea + fave bean flour, gram flour, split pea + gram flour, and they all work. Hope this helps. I’m cooking for 5 adults so I made this using 3 cups Bob’s Red Mill stone ground garbanzo bean flour and a carton of veggie broth(4 cups), garlic and onion powder, salt, white pepper, and cumin. It is Aaaaamazing!!! I hope it sets up as expected because I am hungry! I have tried the Mary’s Test Kitchen version of this and it was very watery and started leaking in the fridge, will I have to worry about that with this? Also, that recipe fell apart when I tried to brown it in a skillet, did anyone try sautéing this tofu, and if so did it hold together? Hi Ashley, i checked Mary’s recipe and that will yield a softer tofu. This is a firm tofu and should not fall apart in tossing. This recipe has less liquid to make a firm tofu that holds well. Chickpea flour tofu (soft or firm) will leak some water as they sit. You can pat it down with a paper towel before use. For sauteeing, I would suggest using some kind of coating on the tofu like cornstarch, flour, breadcrumbs and spices. Thanks so much for your advice, I’m really excited to try this! I followed this recipe and the texture was thick and lumpy by the time it had cooked that I couldn’t pour it in the tray. It felt like it needed more water, but was too late to add it I guess. What am I doing wrong? This is the second time I’ve tried a chickpea flour tofu recipe after eating it in Myanmar. I usually cook at home and would say that I can follow recipes so not sure what is going on here. You can add more water in the beginning. The resulting tofu will be less firm tofu. the mixture does get lumpy quickly and cannot be poured like a batter into the storage container. You can just dump it there and press with a spatula to shape. since I use chickpea tofu in curries and other ways, I need a firmer tofu and this water ratio works best. If it cools down completely into whatever lump shape it was, you can still chop it up and use as tofu or make a scramble. Can I use non dairy milk instead of water? Thanks for your reply Richa. I tried to make it again and the consistently was definitely better, but the texture still doesn’t seem right. It was a bit grainy and not as jelly/firm like. Even when I used less water, once set I was able to cut without it falling apart, but once I tossed it, then it did start to break a bit. I remember when I ate it in Myanmar it had the same texture as silky tofu and it sounds like you and others who make it have the same outcome. I’ve tried the different flours and different ratios of water, and it’s just still not right! The traditional burmese tofu is made differently. It can be made with soaked split peas, combination of split peas, or chickpea or split pea flour/flours that have been soaked overnight. The cooking process might be slightly different as well, like boiling water and adding a thick batter into it or something else. This is a quicker version. You can mix the batter and leave it overnight and then cook it to see if that makes a difference. What brand flour are you using? If it’s been more than 4 days but it still looks okay can I still ue it, is it bad/dangerous to use after that time? 4 days is ok in the fridge. it keeps leaking moisture, so check by smell or anything fuzzy , black or white on it. I made this recipe and taste tested as I was stirring it in the pot. It had a bitter aftertaste. The bitter taste remained even after cooling the tofu. You might need to cook it longer so it cooks through. Have you tried besan in things like besan pancakes or some other way and have you liked that flavor? This is so amazing, it’s one of my new favorite foods! I cut the tofu into strips, coated it with some cornstarch to keep them from melting, and sautéed them in a pan with some grape seed oil and coconut aminos and rolled them up into spring rolls, it was so delicious! I really prefer the taste and texture of this to soy tofu as I’ve always not liked the gelatinous texture of the latter. 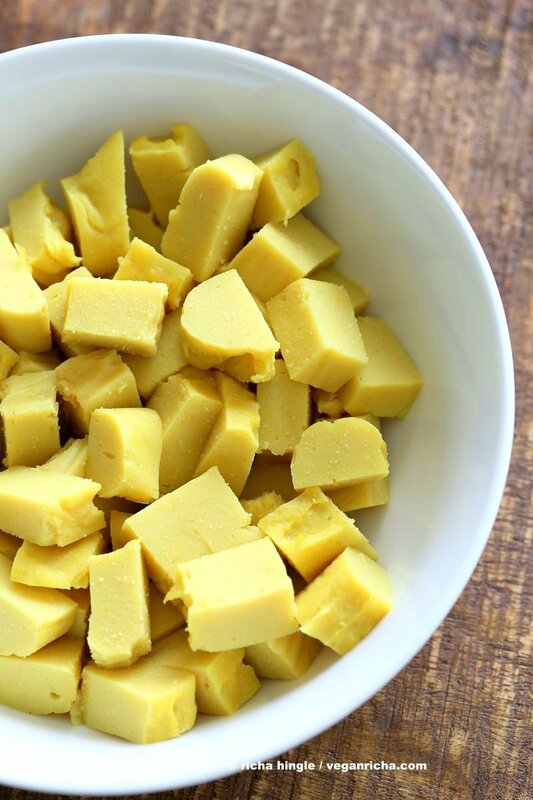 I think I might break up a few leftover cubes in a pan and make a (chick pea) tofu scramble for breakfast tomorrow. This was delicious!!!! Going to be making it ALL THE TIME! This worked perfectly and is delicious. I love the texture and taste! Since I came across your site I have made a lot of your recipes and they always leave me feeling inspired and satisfied. I am working thru the recipes in your Indian cookbook, and I finely tried this one. OMG..it worked! It tastes fantastic but the thing that really got me is it has the smooth, silky, texture with the firmness of tofu. And ridiculously easy. Thank you! Excellent! There are so many different possibilities for seasoning. It was the perfect consistency. I made the tofu, sliced it into chips (French fries), laid them out on a greased oven tray, rubbed oil into all the surfaces and put them in the oven on high (230C) for about half an hour. They ended up really crispy on the outside and soft inside. The better ones were shoestring style, more like frites. The chunky ones were not so successful and didn’t cook through. In France these are called Panisses. Usually you deep fry them but I prefer oven-baked. I served them with a slack hummus, cashew cream dip and tomato salad for dinner. Omg I’m so excited by this recipe!! I just made it and it was delish. Has anyone had a go at frying it in a pan after it has been in the fridge to give it a crispy texture around the edges? Keen for your advice if so! Yes, you can toss it in a bit of starch and pan fry it. I’m wondering if this could be made in an instant pot. I’ve successfully done polenta in one and it worked fine. I think it would make a mess as the mixture gets thick, custardy and sticky. It also needs stirring. clean up will be an issue. Polenta is a different consistency. its not a flour that will thicken into a custard. This tofu barely takes 10 mins of active time. You can make a large batch and freeze. I just made this recipe and it’s fantastic. I followed the basic instructions but added basil and oregano in lieu of the prescribed spices. I also added a bit more water and as such mine had a slightly softer texture. It is great crisped up in a pan. I also used it in between slices of cooked eggplant with tomato sauce as a sort of ricotta stand-in for eggplant parmigiana. So delicious. Sounds great, thanks for sharing! This also answers my question about using this for tofu scramble. Thanks for this wonderful sounding recipe that does not have to sit out for 12 hrs after mixing then another 8 hrs once prepared. I was hoping to use this first for tofu scramble. Do you know if the texture would be good for that (or if I would need a softer variation for that)? This sounds good. I have not tried it but is it okay with a curry sauce? And do not understand the nutritional value i.e. how many carbs per 100g? Hubby is diabetic and we need to watch his carb intake. Yes it works well in curry sauces. The serving size is 4 serves. i.e 1/4th of the recipe. You can find the full value by multiplying for 4. and then calculate depending on how much would work as a serving size for you. I came across this recipe and it just looked way to simple to do so of course had to try it. Oh wow I’m just in love with this!! It’s easy to put together and change the flavors easily depending on what you are using it for. It amazing in curries and thick sauces. It holds up well and I just can’t say enough wow about it! Thank you so much for sharing this! Love the vegan Indian cuisine. Hi there I made this and it’s in the fridge now! Can’t wait to try it! I have 3 questions. Is it okay to eat this directly from the fridge after it’s set or do you need to reheat it? And how do I know I cooked it long enough? I read online that eating raw chickpea flour is not good and I don’t want to make that mistake. I follow the instructions by mixing it a full 5 minutes and then another minute and a half after that. Was it enough time? By the way all your recipes Rock! You’re awesome! I noticed that the nutrition is based on 1 serving – it says 1g – however I think it may be a typo as 2g fat per 1g of ‘tofu’ (for example) seems extreme. I assume this 1 serving should actually say 10g? However I had NEVER thought of using my panisse’s recipe as a tofu replacement! Such a clever idea! Generally I twist this recipe a bit by dividing the liquid amount with half tomato sauce half water, then I add dried thyme and oregano, fresh garlic and sometime chopped dried tomatoes/olives, to finally either pan fry my cut slices or grill them in the oven. Oh, and just to let you know that panisses freezes very well (only the “dough”, not the final fried ones), if already cut in slices and separated by parchment paper. So I imagine that the chickpea tofu will do perfectly well as well, as this is fundamentally the same kind of recipe. Thank you again for sharing this clever and mouthwatering idea, I love all the recipes in your blog, you have helped me so much to develop my cook skills! Thanks! Yes variations of this can be found in so many cuisines around the world. Its amazing! Is there a way to make this recipe from dried chickpeas without a high-speed blender? Could I cook the beans in the water and then puree them? Or puree the beans with the water in the blender? Hi, I tried this recipe turned out well I should think. Please tell me where I went wrong, I think I put it into the fridge before allowing it to cool. I then tried to fry the cubes to add to a veggie stir fry but it broke up, couldn’t get the cubes to remain whole. Did you toss the cubes in cornstarch? that will help keep them whole. Also chickpea flour behaves differently from regular tofu it doesnt need that much cooking time as it wll soften on longer cooking. So just quickly sear after tossing in starch and use in the sauces, curries etc. I made this last night and am now in love!!! This will definitely now be a staple in our household!!! I put the cubes in a kind of spicy spinach sauce roughly based on your Palak Tofu from your Indian Cookbook (I didn’t have spinach so used silverbeet etc). To be honest, there wasn’t lots of ‘tofu’ left to put in the sauce because I kept slicing pieces off all afternoon before deciding what to make it into for dinner….it is truly divine – even plain!!! Thank-you so much for all your amazing recipes…..all that I have made so far have been awesome! 🙂 (if I have already left a message here about this I am sorry – I meant to just after I made it and thought I had but couldn’t find it here so am doing it now (again if already had). Awesome! Thank you for the wonderful note! I finally made this – so easy and so good! A friend on Facebook said that when you heat chickpea tofu, it gets softer – is this true? And if true, I wonder what I could put in the batter to prevent that. I have cornstarch and agar – does this sound feasible to you? Thanks for this recipe – thanks for all of your recipes! Thanks! It depends on how much liquid you put in the batter. More liquid with make a softer tofu, which will soften quicker on being heated. This recipe uses less water to make firm tofu and you can heat it in sitr fries and curries for 8 to 10 minutes. Longer heating time might soften it a bit. It also depends on how you use the tofu. If you bread the tofu( either of soft or firm) and bake, it holds it shape. I just made it again and used only 1 1/2 c. of water, and it came out great much firmer. I love this stuff, even on its own. I just had some with rice – delicious!